Справка Zentimo - How to use program autorun? Справка > How to use program autorun? 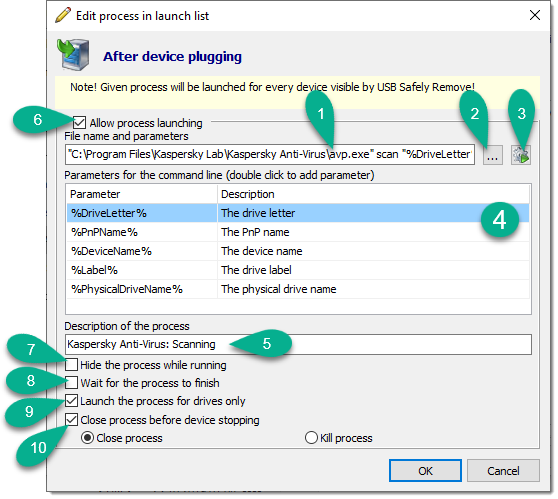 Program autorun feature allows to automatically launch any application on a hot-plug device plugging or before its stopping. How you may use the program autorun? Autorun feature allows to setup program launching not only for a specific device but for all hot-plug devices visible by Zentimo. Thus we can distinguish two kinds of autorun settings: so-called "Local" Autorun and "Global" Autorun. Find more information about autorun options and how to set it up below. Local autorun settigns are applied only for a specific device. It means that for example if you add an application to be launched on after device connection, this application will be launched only on connection of this device, not others devices. If a device has several volumes (e.g. card reader), you can setup autorun for each of its volumes separately. Local program autorun can be set up in the device properties window. Drive choosing pane. When you choose a required drive you will see only processes assigned to this drive in the list of processes pane (fig. 2) and you can add, edit or delete these processes. List of processes to launch pane. By "process to launch" we understand an application or batch file with the specified set of parameters. Processes pane in local autorun shows processes which set up in global autorun as well. Toolbar pane. Toolbar pane contains buttons for adding, editing, removing and test launching of the processes. Add one of predefined command line autorun templates. Read more about usage of predefined autorun templates below. Add new command line for a process autorun. Edit selected process command line. Remove selected process from auto launching. Make a test run of selected process. Make a test run of a selected process group. Link to global autorun settings. Proceed this link if you want to setup launching of programs not for given device, but for all visible devices in Zentimo. Also you can access global autorun settings by double-clicking to global autorun process line or via main menu -> Options -> "Global Autorun" tab. Run "After device plugging" processes on Windows startup. 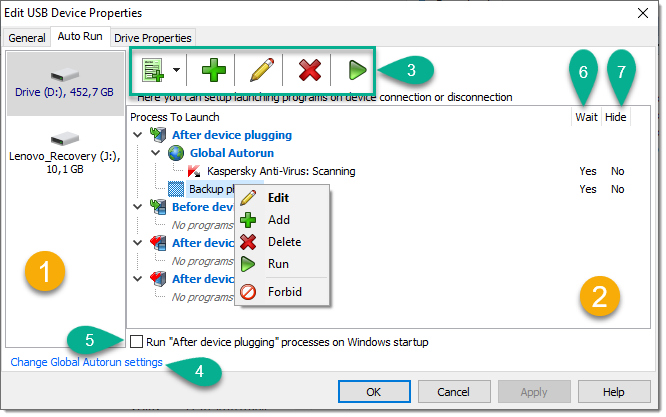 If you enable this checkbox all processes specified in "After device plugging" section will be launched on Windows startup as well. This option is useful when your external drive contains portable applications you need to work or you store all required for work information on the external drive. Wait for the process to finish. This option can be set up in the adding/editing process command line window. If it is checked, Zentimo will wait until this process finishes and only then it runs next process in the section. If this option is unchecked, Zentimo will run this process and immediately proceed to the next process. It is checked by default. Hide the process while running. option can be set up in the adding/editing process command line window. When it is checked the specified process will be run in a hidden mode, when it is unchecked the process will be run in normal mode and will be seen on the display. By default it is unchecked. Global autorun settings are applied to all hot-plug devices visible by Zentimo. It means that if you add an application into "Launch process after device connection" it will be launched on connection of any hot-plug device. Global autorun can be set up in the Options window. "Launch the process for drives only" option. This option allows process auto launching only for storage devices and prevents the process from being launched for non-storage devices. I.e. do not run an antivirus program on connection of a mouse or a USB scanner. This option is available in adding\launching process command line window. Drop-down menu with the list of devices. 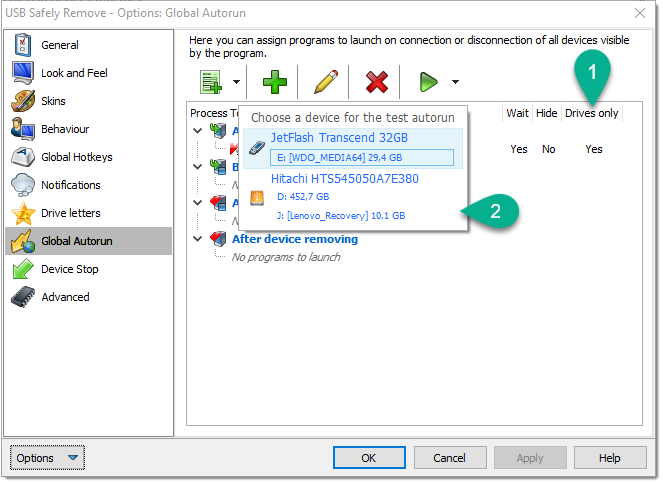 This menu lets you make a test run of a process in global autorun list with settings of a selected device. This window aimed to set up an application startup parameters, such as its file-name, command line parameters, whether it is visible on run or not and etc. Process command line. In this field you must specify a full path and file name of the application. Path and file name must be wrapped by quotes if there are spaces in the command line. Also this string may contain (and it usually contains) command line parameters which pass to the process parameters of the device which this process will be launched for. Find a program.... This button opens "Open file" dialog window which lets you find needed application. Run process. If you have already set all the required parameters to launch the process you can make a test run of the process just to check if the process runs correctly and all required for it parameters are passed appropriately. Command line parameter templates. Parameter templates are special parameters of the process command line which will be replaced by real parameters of the device when the process will be launched for it. Usage of parameter templates instead of actual parameters is required because actual prameters can change. For example you should not specify in the command line real letter of your pen drive because it can change on next insertion (or you can change the letter manually) and an assigned application will be launched with incorrect parameter. So you have to specify %DriveLetter% in the command line instead of e.g. "h:". In the adding\editing process command line window you can see all the parameters and add required to the edited command line with a double mouse click. %DriveLetter% - the drive letter, including colon (e.g. C:). %DriveLetterOnly% - just the letter of the drive without colon (e.g. C). %PnPName% - PNP Name (or Device Instance ID). It is a system-supplied device identification string that uniquely identifies a device in the system. A Pnp name of the device is persistent across system boots. %DeviceName% - device name. It is a name device how you can see it in Zentimo. Initially it is an internal name given by a device manufacturer, however you can change it in device properties so a changed name will be passed to the called application as %DeviceName% parameter. %PhysicalDriveName% - physical drive name. It is a unique name assigned by a system to a drive (or drive partition) which is persistent across system boots. Can be used for an integration with such programs like TrueCrypt which needs to work directly with disk partitions. Example of physical drive name: \Device\Harddisk6\DP(1)0-0+e. Autorun can be set up separately for each drive of a multidrive device. For example if you have a device having G:, H:, I:, J: drive letter, you can assign a program to be launched only for G: and H: drive letters. When autorun triggers it will launch applications assigned to drive G: and pass them all parameters of drive G: and then it will launch applications assigned to drive H:. Autorun will not trigger for I: and J: drives. Process description field. You can define here a short description of the launched process or its performed action. You will see this string in the autorun process list. If you leave this string empty a process command line will be displayed in the list (fig. 1). Allowing/forbidding process launching. With this option you can deactivate process launching on operations with the device. Hide process while running. If you enable this checkbox the process will be launched in a hidden mode, i.e. its window will not be displayed. Wait for the process to finish. If it is checked, Zentimo will wait until this process finishes and only then it runs next process in the section. If this option is unchecked, Zentimo will run this process and immediately proceed to the next process. It is checked by default. Launch the process for drives only. If this checkbox is enabled the process will be launched only for storage devices (The option is available only in "Global Autorun" settings). Kill the process. The program kills the process forcibly. The app will be closed even if it does some actions and has unsaved data. You should use this method only if there is no risk to lose any important data in the application. For your convenience we have included into Zentimo command lines of many popular applications. This great ability enables you to set up automatic scanning of your external drive with your antivirus program, mounting\dismounting flash drive-based TrueCrypt volume and many other things. To choose one of the predefined autorun templates just click " Add predefined autorun template" button. Path and file name of the launched application must be quoted in case if there are spaces in the path or file name, e.g. : "C:\Program Files\My Program.exe". If there are no spaces you may not use quotes, e.g. : C:\MyProgram.exe. Every parameter must be quoted as well if it contains spaces. If an application is a standard Windows application, such as Explorer or Calculator, you may not specify a ful path to executable file, e.g. you can specify this command lines to launch Explorer: explorer, and to launch calculator: calc. If an application is launched directly from a drive of the device you setup autorun for, you must omit a device drive, e.g. : \MyProgram.exe. Scanning a flash drive with an antivirus should be done on external drive connection. In this case the given command line have to be added into "After device plugging" section of Global or Local autorun. Specify a path to the antivirus executable file wrapped by quotes, e.g: "C:\Program Files\ESET\nod32.exe"
In example below we use system command xcopy (copying of files), using it you can implement a simple data backup on external drive stopping\connecting. If you want to save files from flash drive to your hard drive before device stopping given below command line must be added into "Before device stopping" section of the device autorun process list. A pattern of command line to use: xcopy /e /h /y "Copy From" "Copy To\"
Parameter "/e" is used to copy all subfolders including empty. If you do not want to copy empty folders, use "/s" instead "/e"
Parameter "/h" defines whether system and hidden files will be copied. By default xcopy does not copy system and hidden files. Parameter "/y" prevents asking you to confirm rewriting of the destination file. If you want to backup all the flash drive before its stopping, you can use "%DriveLetter%" parameter as a source for copying. xcopy /e /h /y "%DriveLetter%\" "C:\Temp\"
If you need to create more complicated scripts to run files, you can use batch files (.bat or .cmd) or JScript Shell files in which specify several applications to launch.